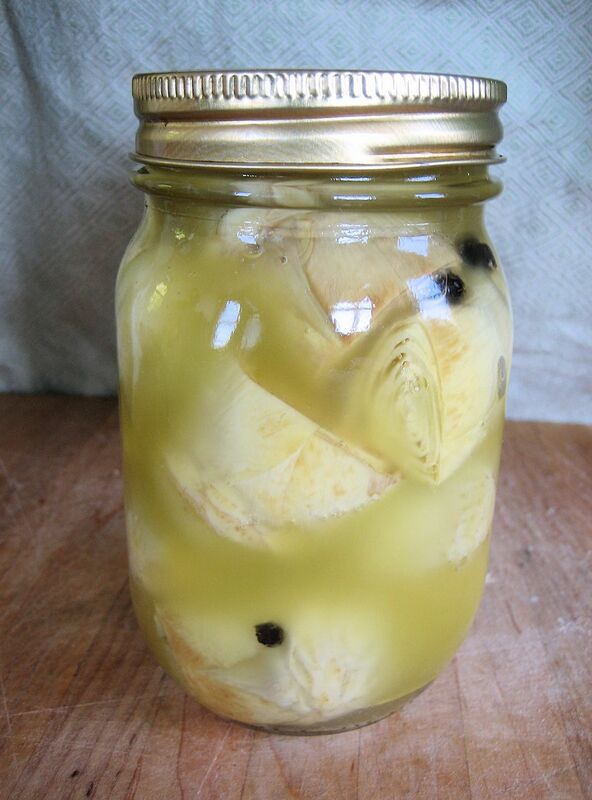 You won't believe the difference in flavor and texture between homemade preserved baby artichokes and jarred marinated artichokes hearts from the store. These are a fair amount of work, but just the ticket if you happen to come across a bounty of baby artichokes. Note: If you've never trimmed or cleaned baby artichokes before, check out this step-by-step photo guide for easy-to-follow directions. In a large saucepan combine the vinegar, salt, peppercorns, cloves, and allspice. Trim the outer leaves, green leaf ends, and stem ends from the artichokes, leaving just the tender pale yellow-green leaves. Cut off the tops of the remaining leaves and trim the base of any fibrous or dark greens parts. As you finish each artichoke, drop it in the pot of vinegar. Bring the vinegar and artichokes to a boil and cook until the artichokes are tender, about 10 minutes. Drain. Meanwhile, bring a canning kettle or other large pot of water to a boil. Place the artichokes in the pint jars, dividing the peppercorns, cloves, and allspice among them, if you like to keep them in the mix. You can also place sprigs of oregano or thyme along the inside of the jars for a decorative touch. Cover the artichokes with oil. Put the tops on the jars. Boil the sealed jars for 25 minutes. Let the jars sit in a dark, cool, dry place for 2 to 4 weeks before opening. Once opened, store them in the refrigerator.